If you’re a professional auto repair technician, an integral part of every job is pulling trouble codes on cars to determine what’s not functioning correctly. To do that, you need an OBDII scan tool compatible with most automobiles made after 1996. You also need the ability to reset certain alerts or reprogram these systems. 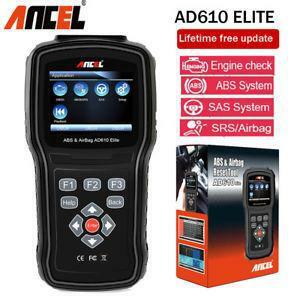 The Ancel AD610 is an ideal all-in-one solution for professionals and DIYers that want a handheld/pocket-sized scanner that does everything a good OBDII scanner should do with some nice extras. Techs with larger hands and fingers will love this scanner, as its generously sized housing and buttons are easier to operate. If you’ve got smaller, more nimble hands than the AD610 might be larger than is comfortable for you. It feels substantial in your hand, but not heavy, making it ideal for all day use while you move car to car and do your troubleshooting. No WiFi and no Bluetooth means you can only update this scanner via USB. The good news is you can record, sync, download and print any readings you take on the scanner. The value of being able to show a customer exactly what is malfunctioning on their vehicle and why it needs to be repaired/replaced is invaluable to building a trusting relationship with customers. If you’re a DIY tech, this also allows you to download a list of known issues for your vehicle and your AD610 will alert you if you are experiencing a known issue. 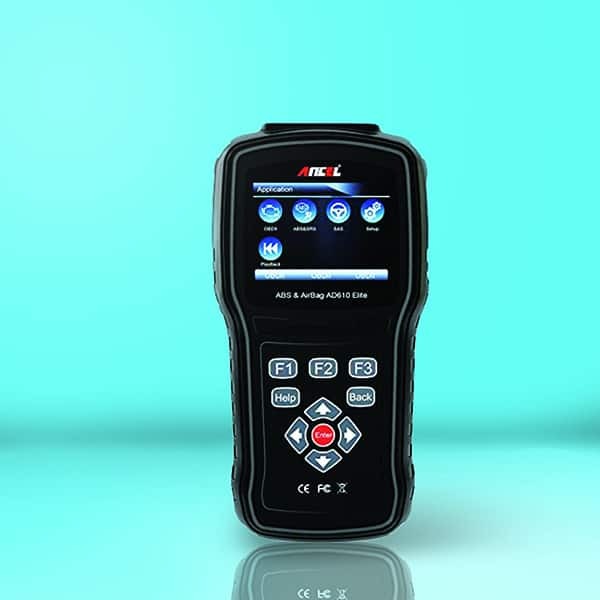 As far as OBDII port connectivity, it doesn’t offer or include a wireless scanner port, so you still need to be tethered via connector cable to your scanner when taking readings or making graphs. This isn’t exactly news since most handheld scanners don’t work with wireless port adapters, but it is a connection method that would be nice to have. What should an OBDII scanner do? Read trouble codes primarily, but any other abilities are nice extras to have. As far as the AD610 goes, there are plenty of “extras” included: you can manipulate and reprogram Airbag Systems, Electronic Suspension Controls (ESP), Automatic Braking System (ABS), and many other details of the safe and efficient operation of a car, truck or SUV. This makes the AD610 attractive to DIY tuners who are looking to tweak their setup for optimum performance. If the previous statement describes you, the AD610 is going to give you everything you want without breaking the bank in terms of costs. You can adjust both the ABS and the ESP settings on your vehicle (if it has them) using your AD610. That being said, it’s not the easiest interface to learn unless you know what you are doing when it comes to programming your automatic brakes or adjusting the individual settings of your suspension. There are online tutorials, but braking and suspension settings aren’t exactly the type of thing you want to DIY unless you are prepared to deal with the potential consequences of that decision. Got some readings you want to save and show to the head of the shop? Need to post a reading online to get help with a tuning issue? Use your AD610 to take a snapshot of your vehicles performance stats and trouble code readings. You can then print them out and scan them, or upload them as a PDF file. This is also a great way to keep records of issues you’ve had with a vehicle in the past so you know what to do in the future with other similar models. Pro or amateur, the freeze frame feature is extremely useful. This is one well bit handheld OBDII scanner. It can survive most drops and spills it would encounter around a pro shop, and it is more than durable enough for regular home use by a DIY tuning enthusiast. The sides have added grip thanks to the rubber pads along the back and sides, so accidents are kept to a minimum. I’ve also encountered few connectivity issues when it is hooked up to vehicles in terms of software, and it runs off car power so you don’t have to carry extra batteries. The interface has something of a steep learning curve, but once you get used to to the software it’s not so bad. I don’t like the screen on this scanner at all. It’s difficult to read in bright light, and despite being a full color display the contrast isn’t great without maxing the settings out. I also happen to have smaller hands, so it’s a bit bulkier than I would like and maintaining my grip can be tricky even with the rubber grip pads. I love how fast this model is for getting scan readings, but I would love a pocket sized scanner that offers WiFi and Bluetooth connectivity. The AD610 is an excellent choice for experienced pro technicians and amateur techs looking to expand their abilities in their home garage. It provides plenty of value versus its cost, and while the interface has a steep learning curve it’s not an impossibly steep. Check one out for yourself, as the AD610 may be the perfect fit for you.